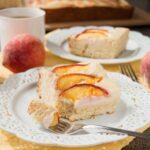 This is a delicious sour cream coffee cake, topped with a velvety cream cheese mousse and sweet fragrant peaches. Peaches are plentiful this time of year and I love enjoying local fruits when they are in season. Nothing beats fresh tree-ripened fruits. The flavor and natural sweetness is just heavenly. 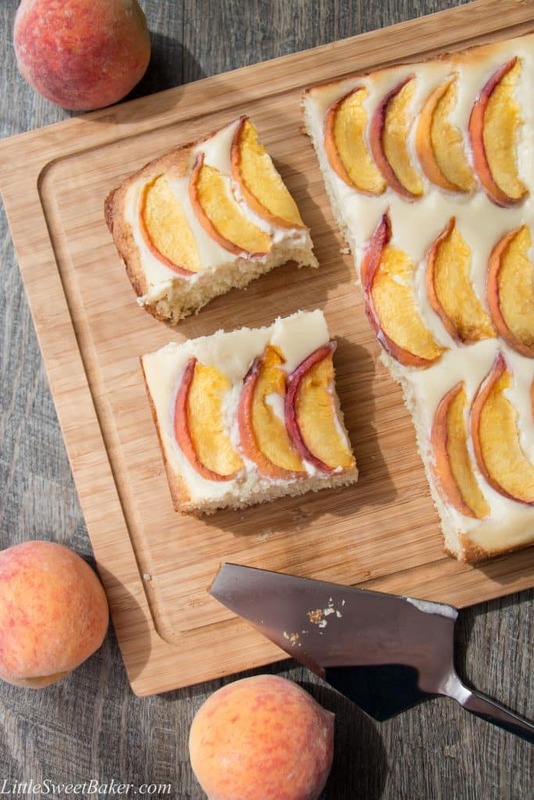 Peaches and cream naturally go together, especially in this recipe. I took a traditional sour cream coffee cake, topped it with a silky smooth and tangy cream cheese mousse, and baked it with some fresh sliced peaches on top. 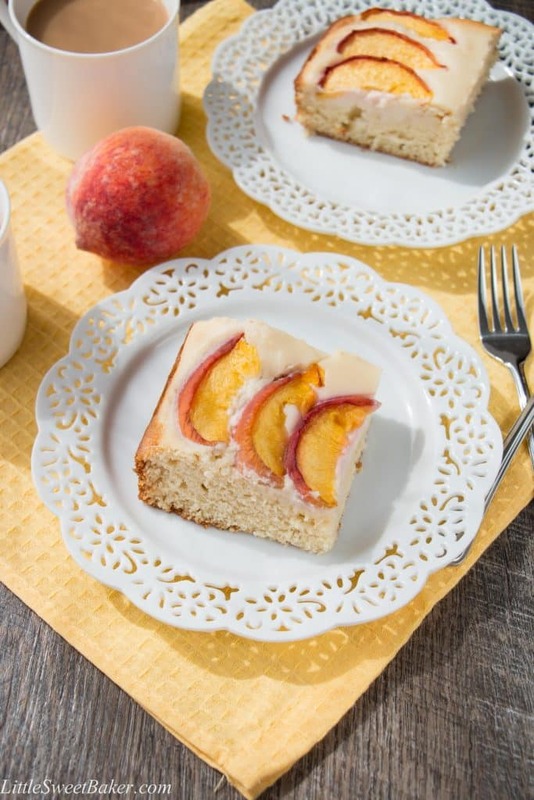 The aroma of this cake is of vanilla and fresh peaches. It’s almost like perfume when it comes out of the oven. 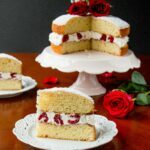 The cake is soft and moist, but firm enough to hold the cream and fruit on top. It is wonderful served with coffee or tea. It can be enjoyed for breakfast, brunch or for an after-dinner dessert. It’s easy to make and easy to serve, which makes it excellent for a large gatherings. The taste of this dessert is rich, creamy and bursting with fruit flavor. Be sure to make this recipe very soon while peaches are at their best! 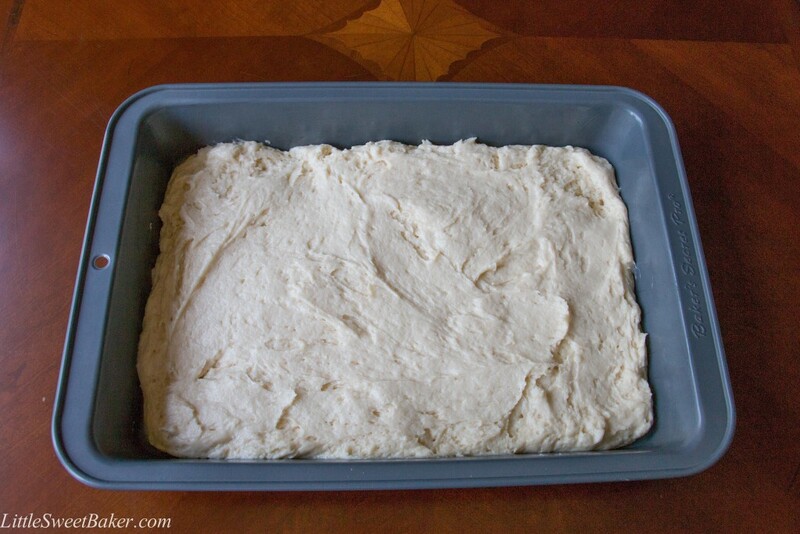 Preheat the oven to 350F and grease a 9×13″ baking pan. Using a stand mixer with the paddle attachment, cream the butter and sugar until light and fluffy. Mix in the egg, then sour cream and vanilla until smooth. Blend in half of the flour mixture until somewhat incorporated. Add in the rest of the flour mixture, blend and scrap down the sides as needed until just combined. Batter will be super thick. 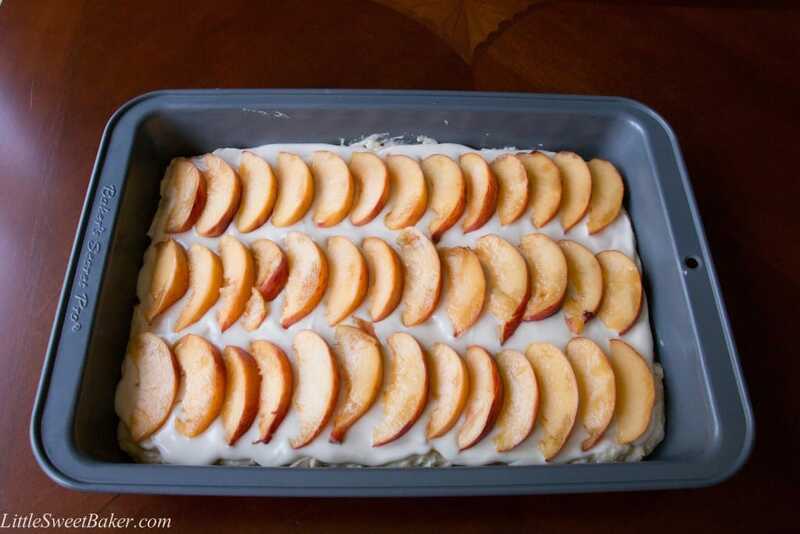 Spoon onto prepared baking pan and spread out as evenly as possible. Set aside. To prepare the topping. Clean the mixing bowl and switch to the whisk attachment. Mix the cream cheese and sugar until blended. Whisk in the egg white and vanilla until smooth. Spread over cake batter and place sliced peaches on top. Bake for 30 minutes or until edges are nice and brown. Let cool to room temperature and serve. 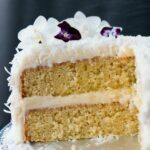 Cake can be stored in the refrigerator for 3-4 days. Bring to room temperature before serving. You can also substitute the peaches for strawberries if you prefer strawberries and cream. Enjoy! My friends and I all decided to hangout and have coffee together. I was in charge of bringing dessert and I decided to bake this. We all loved it and how perfectly it went with our coffee! Thank you! The peaches have been amazing this year. Your cake is just gorgeous. A bit of coffee and I am a happy girl! That. Looks. Amazing. Wish I had one for my morning coffee. Hi there, I’d like to make this today but just wondering, is the sugar in the topping regular sugar or powdered? Thanks! This is the type of cake I find so comforting. It sounds just perfect! So beautifully fresh and seasonal. I do have one question though…. how did you manage to get the entire cake out of the cake pan? I’d have thought you would have cut the squares in the baking pan itself, but I see you have it on a wooden board. Just curious, perhaps you had parchment paper underneath and just lifted it? Gorgeous! Thanks Loretta, I actually cut the cake in half, lifted out each piece with a wide spatula and placed them close together on the cutting board. You can’t see the seam in the photos because it’s faded in the background. This looks amazing – I absolutely love the colours! This looks absolutely delicious! I love peaches and they are always great in baking as well. I like the sound of the cream cheese topping, must taste great. Peaches and cream are an amazing combination. Actually I was looking for coffee in the list. Feel so stupid now lol 😀 The coffee cake looks amazing. Yum, this looks amazing! It is smart how you have spread the cream cheese without going all the way to the edge of the cake to prevent it from browning. I like the colors and presentation! Lovely, lily! This looks awesome, Lily! Love the pictures 🙂 Happy FF! Thanks Sarah and happy FF to you too! Mmm…if I close my eyes and concentrate, I can almost imagine how wonderful this must smell. This coffee cake won’t last long in my house, I’m sure!